The high-pitched sound of children chanting travels out the windows of All Peoples Church, 2600 N. 2nd St., but then abruptly, all voices are quiet. 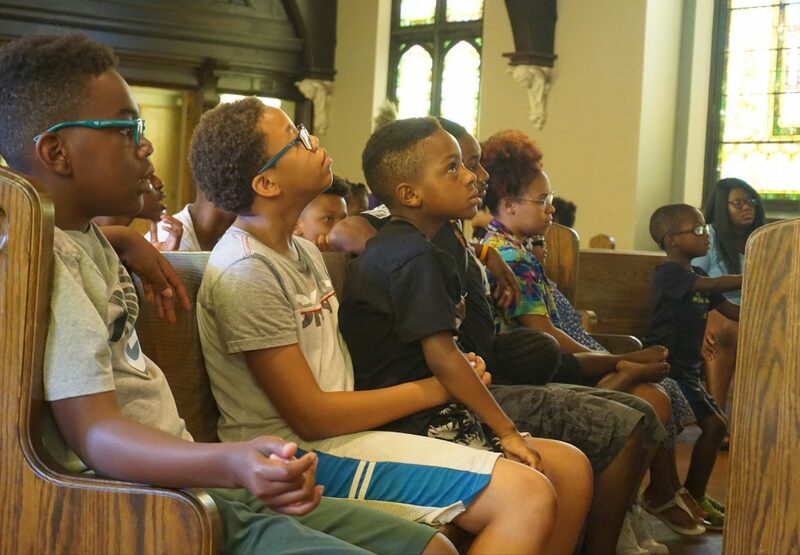 In just a few seconds, the students of Camp Umoja go from cheering good morning to sitting at full attention for their next guest speaker. It is an example of the balance between fun and discipline that Camp Umoja uses to create young community leaders. Camp Umoja, named after the word for unity in Swahili, is a free six-week summer program offered for students in kindergarten through high school. 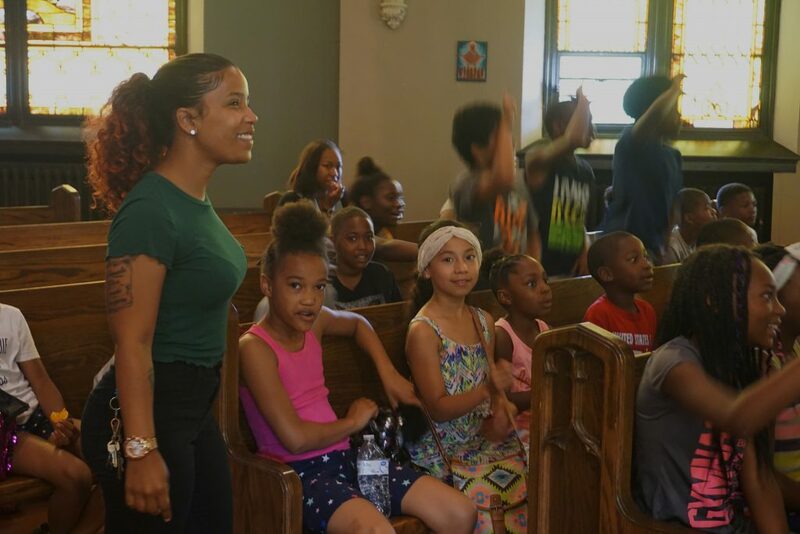 The camp aims to provide a safe place for central city, mostly African-American, children to work on academics while learning to become advocates. “We want every child that has interests and passions to be able to pursue them despite bad schools, neighborhood violence and drugs,” said Allen Ruppel, creator and director of Camp Umoja. Currently in its third year, Camp Umoja is a program of Unity in Motion, a nonprofit Ruppel started 18 years ago. At first, Ruppel only wanted to provide free karate lessons, but he realized other needs in Milwaukee, he said. Over the course of camp, which runs five days a week from 9 a.m. to 3 p.m., 125 students participate in a curriculum that is tailored to teach them leadership, responsibility, compassion and the importance of black history. Each week is focused on a different theme based on the principles of Kwanzaa and the Freedom Schools of the 1960s. The six themes are unity, self-determination, communal work, entrepreneurship, economics, purpose and creativity. After eating a hot breakfast made with ingredients from the garden across the street, students listen to guest speakers, such as Mayor Tom Barrett and Margaret Rozga, a writer and widow of the Rev. James Groppi, who led the NAACP Youth Council during Milwaukee’s open housing marches of 1967 and ’68. They then break into groups to do school work. In the afternoon, Camp Umoja offers special interest activities such as martial arts, drum and dance, and poetry. Every Wednesday, students go on field trips to Brewers games, waterparks, and more. At the end of the program, students present what they learned at an open house celebration. “I really enjoy Camp Umoja because they’re thinking outside of the box and about what’s important to their culture,” said Naomi Young, fourth- and fifth-grade teacher at Camp Umoja. She added that she likes that students get the chance to share their own thoughts. High school students are paid as teacher’s assistants for half of the day. Ruppel said this teaches them accountability and how to run an organization, skills they will need if they want to create positive change. High school sophomore Hollywood Butler said he is no longer a “couch potato” thanks to Camp Umoja. Butler walks 20 minutes to get to camp everyday and takes a bus home. He said he arrives early to set up the sound system and fills in when other high school leaders are sick. Butler said he feels a sense of responsibility to the children he advises and to Ruppel, who students affectionately call Mr. Al. “Mr. Al, he’s just one of those guys that pushes you until you reach your full potential,” Butler said. With this sense of empowerment, in addition to incentives such as the weekly field trip and pay for the high school students, Ruppel said Camp Umoja has an unusually high attendance rate of 96 percent. Once students complete Camp Umoja, they participate in Unity in Motion until they graduate college. Hopefully, Ruppel said, students come back to Camp Umoja every year, moving up to the next level of the curriculum each time. Year round, Unity in Motion staff — with help from organizations such as Pearls for Teen Girls — regularly check in on students to ensure they stay academically on track and involved in their communities. If students meet both these requirements, they are eligible for Unity in Motion scholarships. Ruppel emphasized the significance of building and maintaining trustworthy relationships. He said change is gradual and happens one child at a time. According to Olivia Manns, a high school sophomore who has attended Camp Umoja for the past three years, Ruppel is a father figure to her and the love she feels at camp keeps her coming back. Mainly by word of mouth from students such as Butler and Manns, Camp Umoja already has a waiting list for next year. To accommodate more students, Ruppel said he plans to have two locations, one at St. Marcus Lutheran School and another on the northwest side of Milwaukee.